The Geovision GV-SNVR1611 is a standalone 4K network video recorder capable of supporting up to 16 Geovision IP cameras. The Geovision GV-SNVR1611 records to an internal hard drive in up to 4K Resolution (4000 x 3000) on all 16 channels. It utilizes the H.265 video compression to maximize hard drive storage efficiency. Instead of using a separate POE switch or injector to power the cameras, the GV-SNVR1611 has 16 POE 802.3AT ports built-in to power the cameras directly from the NVR. In addition to POE ports, it also features a WAN port to connect to the local network. Being that the cameras connect directly to the NVR, rather than over the network, the setup process is plug and play and only takes a few minutes with the automatic search and setup feature for Geovision IP cameras. With a 4K HDMI video output that connects directly to a monitor, it eliminates the need for a separate PC to view and playback recorded video from the unit. This NVR has 2 USB ports that can be used to connect a storage device to import or export settings, update the firmware, save snapshots, and save the recorded video in AVI format. In addition, the four sensor inputs and one alarm output allow users to implement external sensors, such as motion or door sensors, and external alarms, such as sirens. 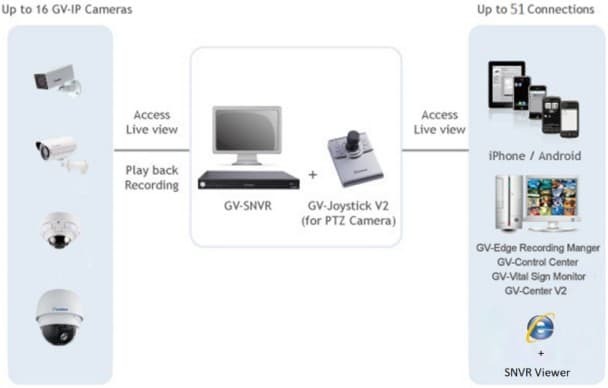 PTZ cameras can be controlled using the onscreen controls or with the optional GV-Joystick V2. The Geovision GV-SNVR1611 can be remotely accessed from a number of devices including Windows PC, iPhone/iPad, and Android mobile devices. 1. The GV-SNVR supports the recording frame rate of up to 30 FPS only. 2. The GV-SNVR1611 supports the recording bandwidth of up to 80 Mbps only. 3. Please Note: For supported IP cameras, the resolutions of stream 1 and 2 both must meet the requirements noted under Product Specification. 4. GV-SNVR1611 also supports EVS-ABD1300 / ABL1300 / ADR1300 and UVS-ABD1300 / ABL1300 / ADR1300. 5. PTZ cameras through ONVIF protocol are not supported.